I had a call last night from a very nice lady who wanted to buy Robbie. I told her that he was not for sale but it got me thinking and realising that I really need to start working on finding him a new girlfriend. Now that I have had Meg home for a few weeks and have REALLY loved my rides on her, I am tempted to start breeding and producing purebreds for under saddle. They make such wonderful, active riding mounts and are perfect for everyday riders wanting extraordinary horses! 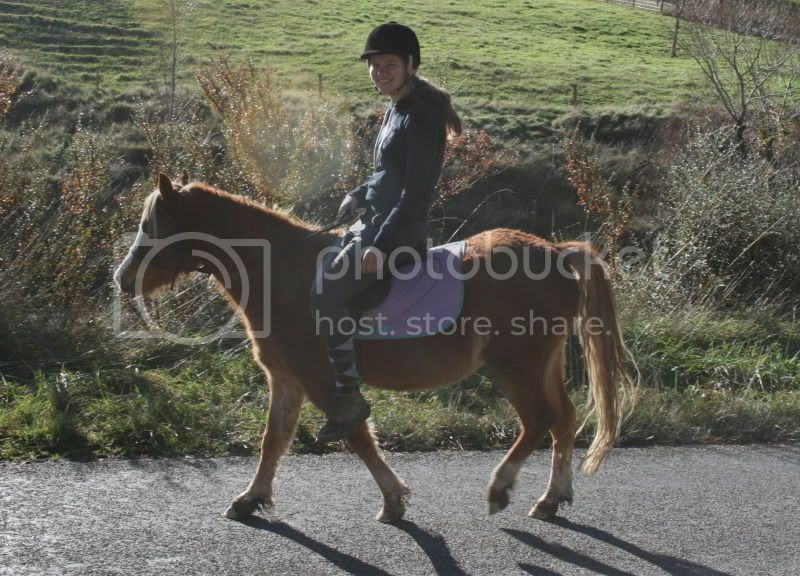 So, the hunt is on for a registered purebred mare. 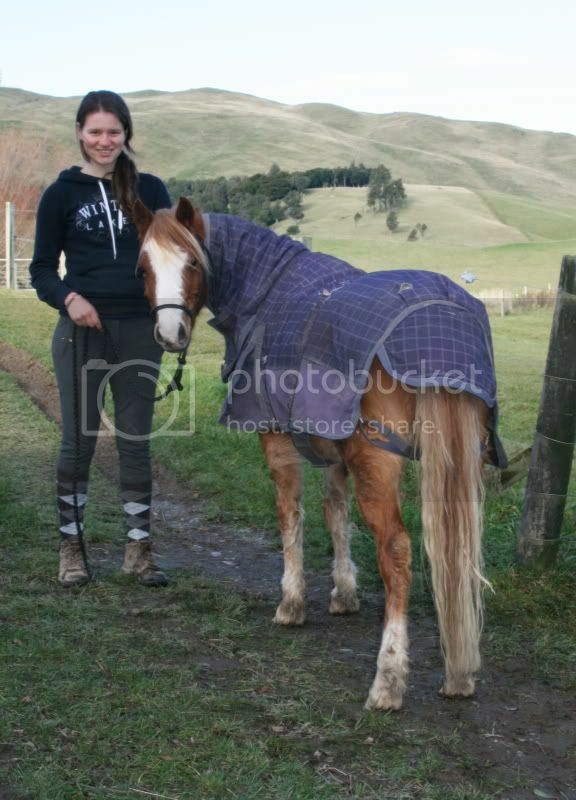 We are not in a position to buy a mare at this stage as nice mares come at nice prices (and for good reason too) but we thought there might be someone out there with a nice mare that is not planning on breeding her for a season or two and might like her gainfully employed in the meantime. It's a good way to get your mare in foal for nothing plus save yourself 18 month's worth of feed/worming and trims etc. 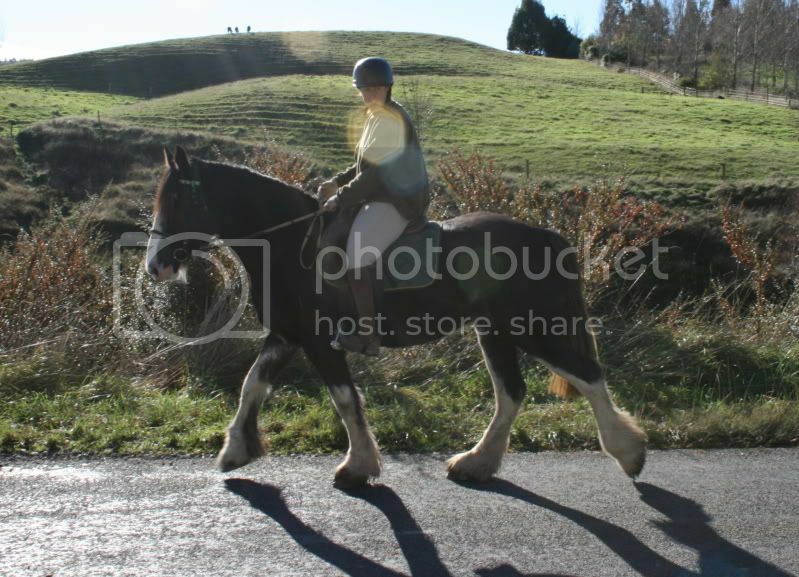 So, if anyone reading this perhaps knows of someone with a nice registered Clydesdale mare sitting in a paddock, pass on our details, we would love to hear from you!!! 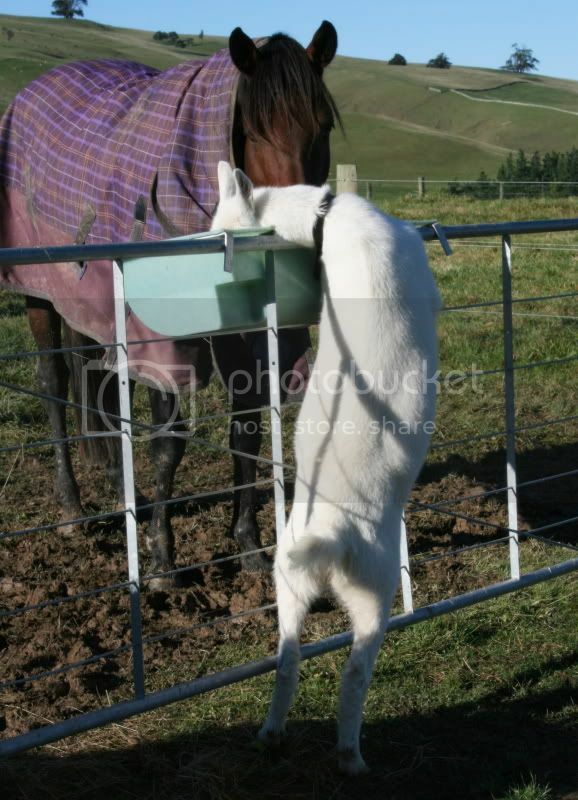 First up we have Reilly 'sharing' his breakfast with his pesky goat neighbour. Clearly you can see that China (who is obviously starving) must ... have ... food!!! 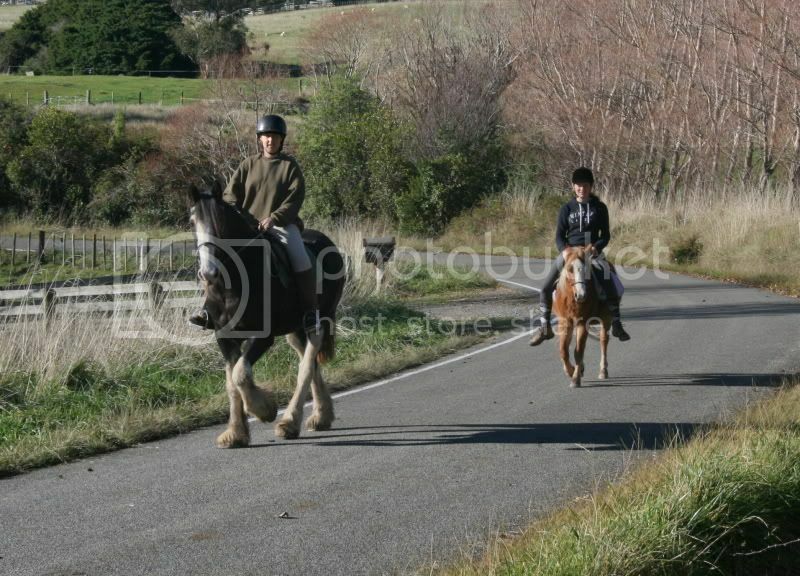 Next we have some photos from today's ride. 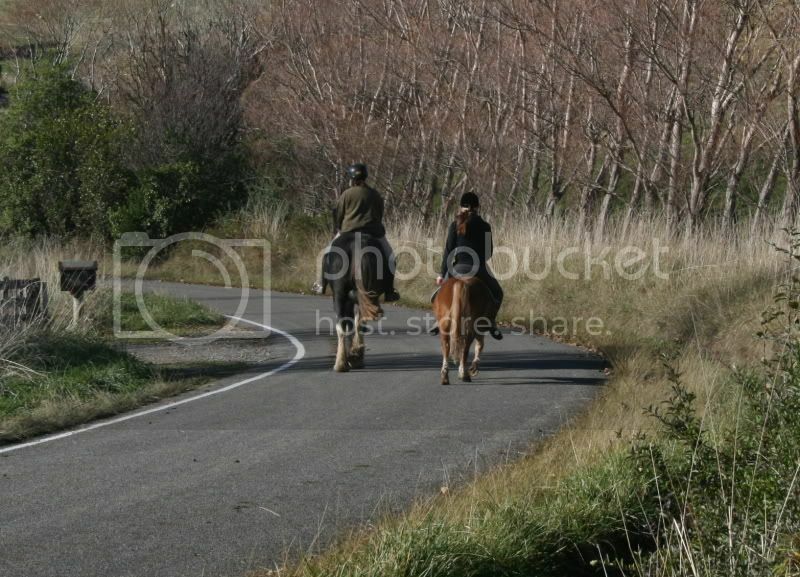 Maxi had his very first ride down the road and Meg had her very first ride down the road WITH company. The 'kids' had a blast and we went about 2km down the road and then came back up and took them a couple more km up the paper road (complete with wooden bridge and scary cows) - It was great and although my thumb hurt (if you look closely in the pic of Meg and me walking down the road you might see my brace), I really did not notice it too much and Meg was so well behaved I never had to worry about it.